Imagine job hunters preparing and competing for a job match like shadow boxers preparing and competing for (instead of in) a boxing match. No direct toe-to-toe, in-your-face mano a mano or group-interview quasi-gladiatorial competition with rivals. No close reviews of competitor’s credentials, profiles, self-promotions, reviews, strengths, weaknesses, “friends” lists, or ratings. Not a moment being tested by and against any of them directly. Instead, just quiet, disciplined, focused and intense solo preparation, like an online course or resume refinements, and maybe some self-testing and rehearsal in a mirror for a private job interview and for the job itself—like private confession and salvation all in one cloistered go. Of course, there are competitors—but mostly unseen, and only threatening at a safe distance in time and space, to which they are harmlessly and forgettably relegated. No, the shadow-boxer job-hunter’s competitors although very real indeed, are—or, increasingly, were—mostly out of sight (and therefore to some extent out of mind) or, if visible at all, only in the office reception area, waiting their turn to unwind their nervously tubed resumes. 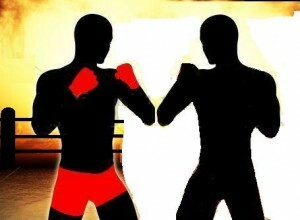 The comforts and advantages of shadow boxing for a job match are (were) like those of conventional dating: a chance to be tested, but not by an in-your-face competitor, just by whoever is doing the choosing on a civil and comparatively slow sequential basis (e.g., a date with you on Friday, the other guy on Saturday). Modern “speed dating”, with its high-velocity, shoulder-to-shoulder competition is one analogue of simultaneous job competition: given the typically short shrift it provides, it is quasi-simultaneous, especially if the competition at the next table is louder than you. surpluses of others with comparable credentials. Now, they crowd and jostle you in the job arena or the career counseling office, like gladiators stage-center in the pit after (in the sense of “in pursuit of”) you, rather than in the cages and chambers under it and after you (in the sense of “later”). Even if you are not arm wrestling anybody for a job, you know that there’s a lot of competition—stiff competition—with an awareness that did not exist before the Internet, overseas outsourcing and the post-secondary education explosion (in an economy having seizures). When the Web and the degree were the stuff of dreams, competitors for jobs were “sequential rivals”, trooping one-at-a-time into their private interviews. Now “simultaneous rivals” is the better description, even setting aside group interviews. Internet self-promotion and competition: A generation and a half ago, the best, if not only way to promote yourself to a university or employer was to be captain of the football team, class president, valedictorian or a National Merit Scholar and to be sure to mention it in your CV. But even those accomplishments won you a limited audience, namely, those in your school homeroom, your home town, community of non-virtual friends or family and those to whom you were applying. You were a competitor who had competitors everywhere—but mostly as unknown to each other. Now, thanks to the likes of Facebook, YouTube, blogs, Twitter, Flickr and LinkedIn (for those who’ve already gotten their degree and a job), anybody with any ambition, conceit or vanity can become an “in-your-Facebook” competitor, even if only through an online micro-resume or grin-laced internship photos posted on Picasa. On top of that, the online “application” doesn’t have to be job or school specific: anything and everything one has ever “accomplished” or been blessed with as a “talent” can (and usually is) displayed. Facebook addicts are particularly vulnerable to this kind of massive simultaneous competition. Because of their need to have lots of Facebook “friends”, they are at risk of a dawning, haunting awareness of how plentiful people almost exactly like themselves are. Skills-Jobs Mismatches: The mantra “great jobs, wrong skills” reflecting wrong degree at the wrong time in the wrong market (which may be reducible to simply “wrong market”) means that not only is there too much competition for too few jobs, but also that there are too few credentialed candidates for otherwise plentiful jobs. For those who fail to find a job because their skills are inferior or simply irrelevant, this means repeated pummeling in the form of rejection letters or, equivalently, rejection silence. The beauty of what might nostalgically be called “the Age of Shadow-Boxer Job-Hunting” was that winning happened at least once, if not often, creating the understandable impression that one was a winner, maybe even a champ (since there was no evidence to contradict such self-congratulatory hypotheses. I know, since that is how I usually got jobs, fellowships, etc.). Never “winning” easily translates into paranoia about competition, unknown in an age or circumstance of successful career shadow boxing. Trivialization and homogenization of credentials: Having a degree is now as common as having the common cold. One problem with this is that in not realizing just how common either of these is, insufficient preparation and understanding tend to foster a sense of exceptionality or invulnerability and impede the taking of prudent steps to cope with the associated symptoms and problems of having a common cold or degree. In the case of the commonplace degree or diploma, repeated rejection because of now-trivial dime-a-dozen credentials is very likely to be experienced as a symptom of fierce competition from unseen, but punishing opponents and rivals. Group interviews: Something I witnessed for the first time years ago while working in Japan (without being subjected to one myself), group interviews are now well-known in the West, and the norm in some industries and companies, e.g., at Apple. As the utter antithesis of shadow boxing one’s way into a job, the group interview is one knell of shadow boxing’s death bell. Over-population: While recently taking a few photos at the venerable and gorgeous University of Glasgow, I was stunned by the numbers of students flowing through the streets at the gate. Perhaps that’s because my undergraduate education was very cozy, with total enrollment of no more than 1,200 or so (in contrast to the University of Glasgow’s 23,357 total enrollment). Anyone alive sixty years ago and now has to see and feel the effects of having almost three times as many people on the planet (or on the streets) now, even if nowhere near a big university. It is very important to note that seeing so many more others and seeing them as competitors will not be sufficiently offset by positive perceptions of them as job creators or otherwise consumers of one’s (future) labor—even if it should be, because, in general, human nature being what it is, fear trumps hope. (If it did not, high-density urban areas would be a whole lot friendlier than they generally are. The counter-consideration that this expanded population comprises those who will supply jobs as well as those who will competitively demand them is valid, but only to a point. First, gains in productivity, outsourcing of jobs, and irrelevance or triviality of credentials may nullify expectations of proportionate increase in job supply. Secondly, there is the problem of an increase in the numbers of competitors per person: considering marriage prospects as a parallel case, it may be tempting to argue that if the numbers of males and females increase proportionately, i.e., in tandem, there will be no increase in competition for mates or dates. However, although that is correct when viewed collectively and in the aggregate, in individual cases of individual competition, each prospective mate now has almost three times as many potential candidates to assess and choose from as his or her grandparents did—which represents a huge increase on the supply side of the selection equation, and therefore a tremendous increase (if not trivialization) of competition among suitors. The same is true in the job market, in that even if the number of jobs matched the number of job seekers when the numbers of the latter swell, for any given position, a fully informed decision about whom to hire would require vetting many more competitors per applicant. However impractical or unnecessary that may seem (given a huge and dynamic market in supply-demand labor equilibrium), the impression and awareness of more competition per competitor will become more intense. What does all of this suggest? If you are among those who can still shadow-box their way into a job or a school and enjoy that, take advantage of it while you can. The handwriting, as well as the shadow, is on the wall: One way or another, your competition is likely to eventually, if not already or soon, be in your face… as well as on Facebook.